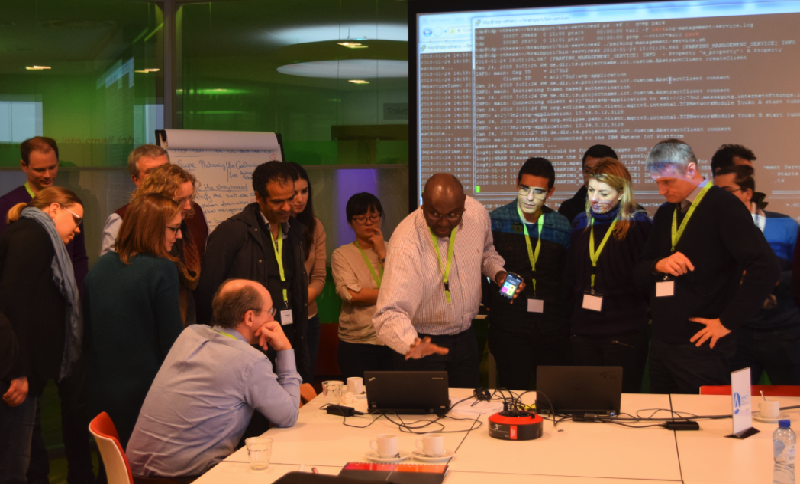 This week, the European AUTOPILOT project met at the AutomotiveCampus in Helmond for its first Plugfest. During this event, multiple software solutions for automated driving were demonstrated by leading developers. These solutions form the backbone for AUTOPILOT’s approach to rely on the Internet of Things to advance automated driving, Signals are represented in a virtual cloud to inform driving decisions by automated systems. The Dutch research institute TNO, which was hosting the event, kicked off the demonstrations by explaining the communication protocols for its automated highway driving service. With regards to V2V and V2X Communication, Antoine Schmeitz of TNO pointed out that “a certain degree of redundancy is needed. We cannot make mistakes on the highway.” The French consortium Valeo demonstrated an array of sensors, which picks up information about the road condition and transmits them to other cars on the road. The German research institute DLR demonstrated the back-end and front-end software solution for automated valet parking. Concluding the demonstrations, the TU Eindhoven showcased how smartphone signals are visualised on real-time on a map, which allows rerouting to avoid congestion on urban roads. All these functions are expected to be interoperable across countries and systems. A main concern of the AUTOPILOT project is that their Internet of Things platform remains open across Europe. In parallel to the demonstrations, developers from the project were working on the systems to ensure this. TNO, Valeo, DLR and the TU Eindhoven are all partners of the CAD project.